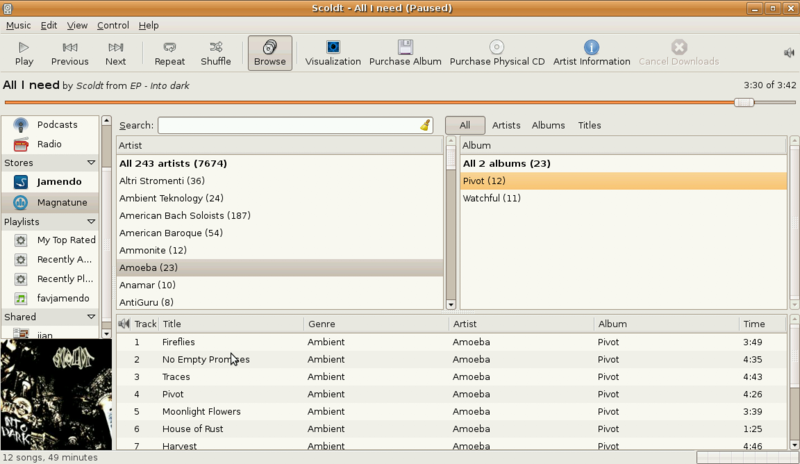 A year and a half ago, the excellent Linux music player Amarok added extensive support for Magnatune. 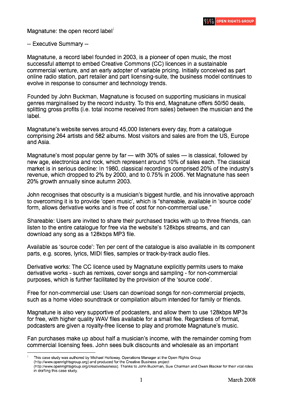 The programmer, Nikolaj Hald Nielsen, did this on his own initiative, simply because he thought it'd be a neat thing for his favorite music player to have, and because he liked Magnatune's business philosophy. I really like Amarok, so I volunteered that I'd be happy to donate 10% of gross sales at Magnatune caused by Amarok. I was also so pleased with the quality of Nikolaj's work, that I hired him, and he now spends 50% of his time on Magnatune, and I pay for him to spend the other 50% of his time on Amarok. I'm *very* pleased to report that Amarok users buy a very healthy amount of Magnatune music. They can listen for free from inside Amarok, so that the streaming albums appear in Amarok as if they were local music, and they can easily buy the music in various open formats. So far, Amarok has caused $11,557 in sales of Magnatune music! This morning, I very happily sent a $1155.70 donation to Amarok. I also made the same offer to Rhythmbox, another great music player for Linux, and will be sending them a donation shortly as well. Their built-in support for Magnatune is *excellent*, and I've been personally using it myself to listen to our own Magnatune music. 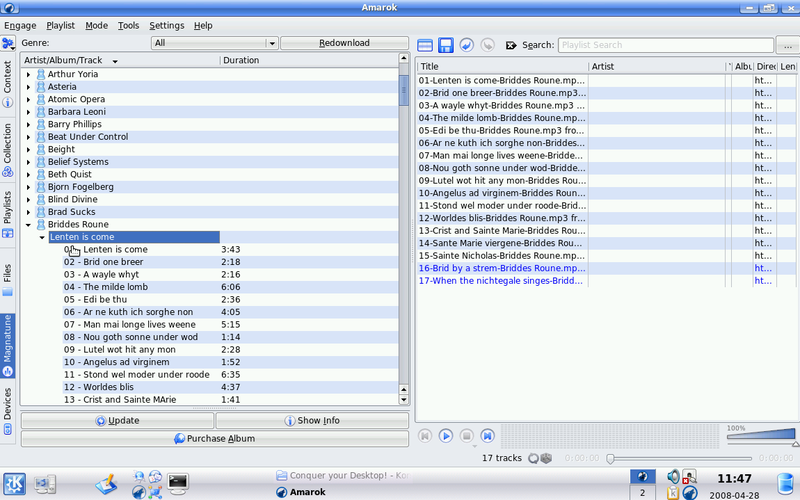 Rhythmbox is installed by default on the ultra-popular, recently-released Ubuntu 8.04. I am particularly glad that we are supporting Magnatune, which has articulated a really good future for the music industry," Shuttleworth said. "The problem with the music industry has not been the musicians; it has not been the music; and it has not been downloads. It has been the record companies. So to have a record company that says, 'Well, there is a better way to do this' feels like a good thing for us to support. So, that's groovy." I've been talking to the programmer behind the magnatune support in Rhythmbox, and he plans to add a bunch of features to it over the summer. Cool! The Open Rights Group has published a detailed case study of Magnatune and how we operate. It was written by ORG's Michael Holloway, who did an incredible job of synthesizing information from our web site, interviews with me, and my dozens of comments. This is the best analysis of Magnatune I've ever read, and it goes over just about every aspect of our business model. The document is currently available as a PDF download as well as available on the ORG wiki. It is under a Creative Commons by-sa license, and so can be freely distributed. "your average geek conference but with a bit of rock concert flavor"
The very first LugRadio Live USA in 2008 (http://lugradio.org/live/USA2008/start) is taking place at The Metreon in San Francisco on Saturday, April 12 and Sunday, April 13, 2008. Magnatune founder and CEO, John Buckman will give a talk on the main stage on Sunday. In 2007 LugRadio Live premiered the conference in the UK and it was so successful that the event founders decided to export the community-based conference to “glorious” San Francisco. LugRadio Live has a strong reputation for providing a range of topics about free software, open source, digital rights, technology and more, a compelling list of speakers, exhibitors and birds of a feather sessions, and wrapping it all in a unique, fun, loose, social and inclusive event, which is often described as combining the atmosphere of a rock concert and a computer conference. John will be speaking on Sunday, April 13 on the Main Stage from 11:00 am to 12:00 p.m. He’ll be discussing Creative Commons, Open-Source-Institute requirements for “open source” and what the future looks like in a post-DRM music world. The event will present around 30 speakers, over 20 exhibitors, an eclectic range of BOF sessions, and plenty of additional sessions such as our debate discussion panel, a showcase of five minute talks, tech demos, and many opportunities for socializing.